Offensively, that was a wonderful game to watch. Any time you make 90 points against a legitimate team look pedestrian, I'll be happy. Defensively was another story. As you may recall, my post yesterday expressed my desire to have Russell return to form. Unfortunately, he did not. The bright side is that although he is not playing well defensively and the team again did not force many turnovers (8 on 3 steals), the Hawks won easily. Even more impressive was how they were able to score 90 points rather easily, even without getting many easy transition baskets. And lastly, they were still able to hold Methzou to an acceptable 71 without applying much pressure. Then again, this was only Methzou. They're hardly UTEP, but would the result have been so favorable if the game were against a respectable top 30 foe? As I said, offensively I have very few complaints. There were certainly some ill-advised shots and Sherron made some pretty poor decisions, but overall it was solid. Methzou gave several different looks; from the full court press, to a man-to-man pressure, and of course a zone. Early on the Hawks took some dumb shots from the zone, but once they figured it out, there were very few sub-par offensive possessions. They moved the ball well and the post players generally finished the job when they were given the chance to score. I can't say I liked what I saw on the other end. Maybe I'm putting too much of this on Russell, but from what Self says, as he goes so goes the team. And from what I can tell, there's no reason to think otherwise for a few reasons. 1) Most obvious is that by playing good defense he can take his man out of the game. 2) His pressure allows Mario to get in the passing lanes. 3) Our bigs foul enough without having to worry about helping out on a point guard that's in the lane all the time. Rush: One of his best performances of the year. Went for a team high 19 points and 6 rebounds. But more importantly, he was looking for his shot, taking the open three when he had it and driving when he didn't. It goes without mentioning that he again made Matt Lawrence irrelevant. Collins: He made some poor decisions, especially early on, but overall I think played pretty well. He seems to be getting his burst back and finished with 12 points, 4 assists and 4 rebounds. Robinson: Offensively, I think he looked pretty good. Only took 6 shots, ended up with 7 points and 4 assists. No complaints there. But his defense is really worrying me. If Keon Lawrence (25 points on 10-13, 6 assists, 4 boards and only 1 turnover) can get in the lane like that, what will Derrick Rose, Darren Collison and Tywon Lawson do? Not only does it make for easy scoring opportunities for them, but also for their post players and it's an easy way to get Arthur in foul trouble, as obviously occurred last night and has become almost routine. Arthur: As mentioned, he didn't get to play much due to foul trouble. Worthwhile to note that Holly Rowe made her first contribution to a game by referencing her conversation with Danny about how many of his fouls come from him not getting his work done early and being in good position. But when he was in he rebounded well and scored pretty easily. In only 14 minutes, he had 13 points and 6 boards. Jackson: I would have liked to see him get a few more looks as he only took 6 shots. But he finished with 6 points, 9 boards, 2 assists and 2 blocks. His defense on Carroll left a bit to be desired, but I don't have any big complaints. Kaun: As Tom Keegan so eloquently pointed out, he probably played with more intensity than he ever has. Like Arthur he got in a little foul trouble (some questionable), but was dominant when he was in with 12 points, 4 boards and 2 blocks. Aldrich: Talk about good timing on my part. 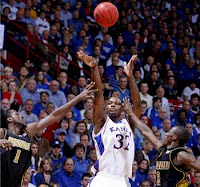 As I said, I thought he deserved more minutes and due to the aforementioned foul trouble, Bill Self complied. As I also said, he rebounds better than anyone on the team and he didn't disappoint me grabbing 9 boards in 12 minutes to go along with 6 points. As suspected, his defense left a little to be desired as he doesn't yet move his feet well and has trouble beating his man to the spot. There were also 2-3 instances where guards threw it to a spot expecting him to be there; only he wasn't. I still think he showed enough to prove he is more than just five fouls and a big body. Depending on how much you agree with me, it's hard to leave this game feeling too badly. They easily and badly beat a decent team that was extremely fired up and trying to prove something. (What else can be inferred from their not shaking hands after the national anthem or prior to the opening tip?) 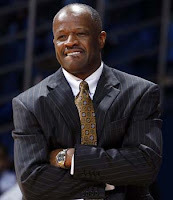 Fran will have you believe that Mike Anderson is brooding with integrity for playing so short-handed. That's a good story and all, but when the only guy they're playing without is the one that's unavailable due to injury, it's hard for me to buy it. And since all of them were only suspended against lowly Nebraska (a game he likely thought he could win without them), the 2 best were brought back first, and all were brought back against their rival in a game where they wouldn't shake hands, INTEGRITY isn't the first word that comes to mind. Call me crazy. Low and behold, after all the Wildcat praise last week, here we are at the mid point in the Big 12 season and Kansas sits atop the pack at 7-1. That same KSU team is a game back and along with Gameday will come to Lawrence on March 1. The next two games for the Hawks are home against Baylor and down in Austin against the Longhorns. In my opinion they are basically the same team with Texas having a slight edge (which pretty much bore out last weekend in Austin). Both are guard oriented, can shoot and like to play at a tepid pace. Russell will surely be a key and Kansas' bigs should be able to exploit an obvious advantage in the paint, but you never can tell. Assuming there isn't a collapse anywhere along the way, I think a win in Austin assures them of a #1 seed. To basically plagiarize a line, the person who did this is clever, yes, but extremely cruel. No link, but just thought I'd point out that I've always been a Bob Knight fan and I'll miss him coaching in the Big 12. As for his timing, it certainly seems questionable, but I won't kill him for it. As a parallel, it seems to me like he wrote his will and set up his estate to transfer seamlessly once he passed; which he apparently chose to do yesterday. Among the official NFL Combine invites were 5 Kansas Jayhawks: Anthony Collins, Derek Fine, Marcus Henry, James McClinton, and Aqib Talib. All of these players are great and deserving but it still makes me laugh that after being selected the Big 12 Defensive Player of the Year Nick Reid wasn't among the invites. Chalmers: I suppose reasonable minds can always differ, but I don't think there's any question that he is the most indispensable player on the team." I said the exact same thing to my friend last night. I have a feeling that Russ's knee tendonitis from earlier in the season has worsened. We won't know until after the season but this would explain his poor defense. as crazy as it sounds, i really hope that Russ's play is just due to a slump. Obviously if it is tendinitis it would be worse of for us in the long run. I hope for the best, we obviously play so much better when he is playing d like early in the season. Maybe they just need to do what they can to limit his minutes until March? I'm looking at you, Sherron.